A few friends and I recently took a quick trip to Miami. It was my first time there, and we had the most wonderful stay at The Setai at Miami Beach. It is without a doubt one of the prettiest and most spectacular hotels I've stayed at. The hotel smells absolutely delightful. 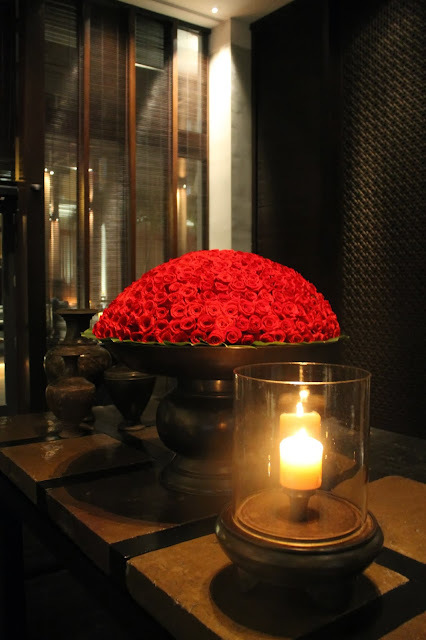 A subtle orange-inspired scent was created specially for the Setai by Roja Parfums just last month. The scented candles are sold in the spa of the hotel ($125 each), but were unfortunately sold out when we checked. During the check-in process, each person is given a cold towel and Setai iced tea, which has a dash of simple syrup (the best way to enjoy iced tea! ), and lemongrass, a combination that gives off a nice tropical taste. In the suite (all rooms at the Setai are suites), there were Teuscher truffles waiting. These are my favorite chocolates ever. My sister's boyfriend gifted her a huge box of them one year, and I probably gobbled down over half of them. The one at the Setai was a milk chocolate truffle with hazelnut bits. Out of this world. One of the three swimming pools. Each is at a different temperature. We spent time at the beach on the first day, and I was sad to discover that the sand at Miami beach is not soft and powdery, but rather quite rough with large granules. We opted to spend the next two days at the pool, where service was better, and there were even complimentary treats! The staff at the pool was superb. They are very helpful with setting up towels complete with a rolled up towel to act as a pillow on your chair or bed of choice. This service is given also at the beach. 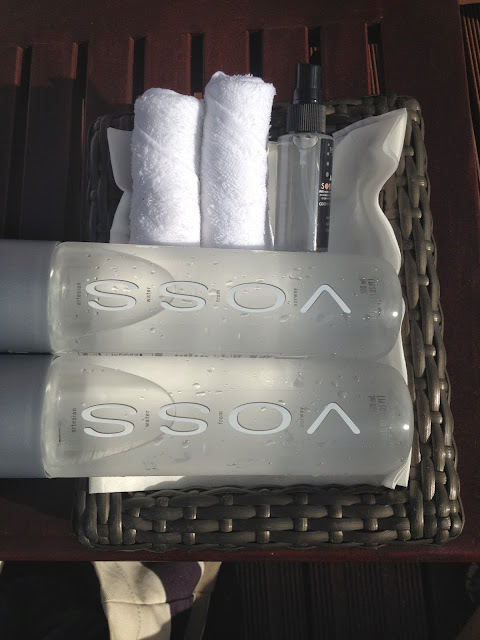 Complimentary Voss water, cold towels, and face spray is also brought over once you're settled. Periodically, treats like these as well as shots of smoothie are brought around to all the guests at the pool. We loved the complimentary shots of sage colada so much, we all ordered alcoholic full-sized ones. 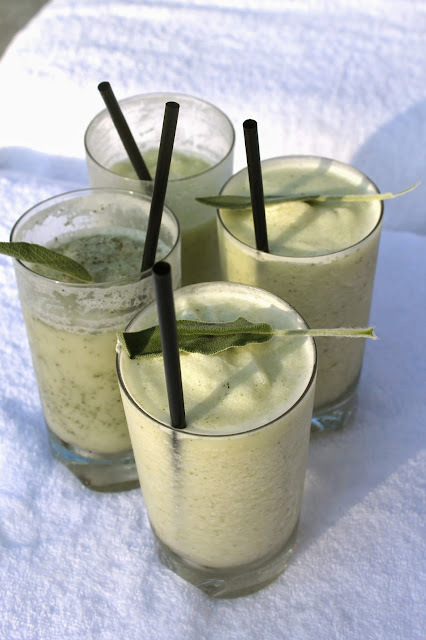 The best hot weather cocktail. 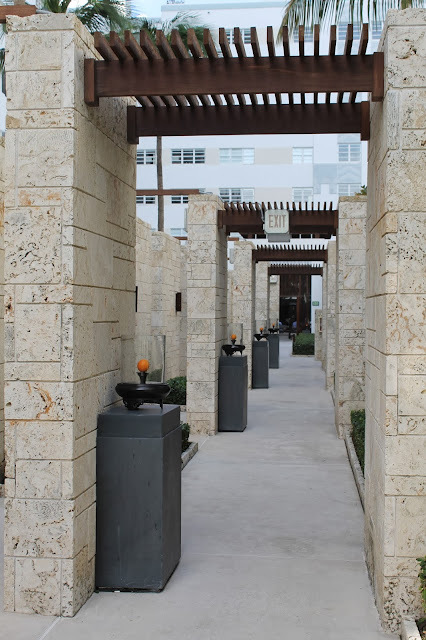 The walkway between the pool/beach and the hotel. At night, the oranges in the display cases are switched for candles, bringing a beautiful and romantic ambiance. The only hiccup all weekend-- these $18 waffles at The Restaurant of the Setai were incredibly disappointing. The waffles were so chewy, I barely ate half of this. When I then asked a server about it, she said "they are supposed to be chewy". And that was that. 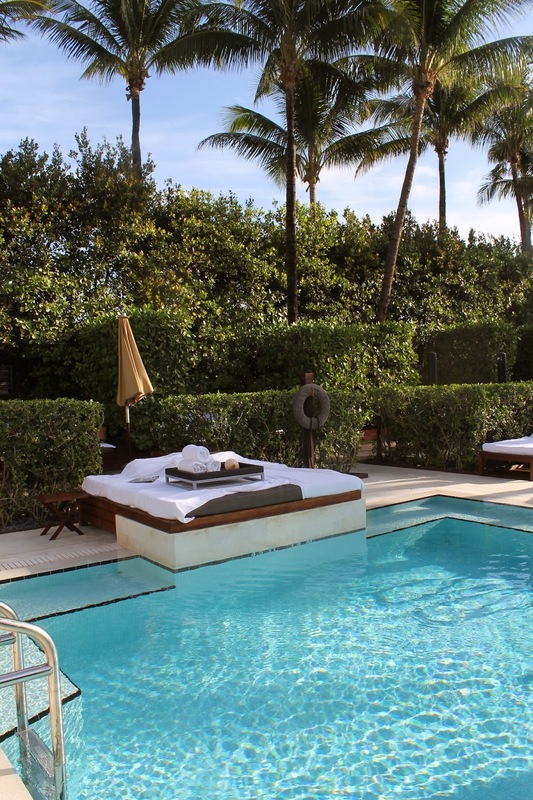 I would definitely recommend a stay at the Setai if you are looking for a gorgeous hotel with impeccable service. Do note that the clientele is generally in their mid 30's or older. It's not a party hotel by any means. We did enjoy the top 40 music being played at the hotel next door while at the pool. It wasn't too loud, but it was definitely audible. The location of the hotel is also very convenient to walk or take cabs to restaurants. Most of the restaurants we wanted to visit were around a 20 minute walk from the hotel. We also used Zipcar, as one of the lots was only 3 short blocks from the Setai. Reading this (and looking at your pictures) makes me realized I REALLY need to stay at the Setai! Gorgeous.